An Apple executive said Monday that iOS, which is used in iPhones, iPads and iPods, will be displayed on in-vehicle screens and allow customers to access phone features without lifting a finger. Apple Inc. wants to invade automotive instrument panels by making its iOS mobile operating system accessible on vehicle screens. The initiative, which Apple discussed publicly this week, creates a challenge for automakers, who want to keep up with the latest connected-vehicle technologies but still control the overall experience with their own operating systems, said Thilo Koslowski, a vehicle communications technology analyst at research firm Gartner Inc.
With the use of iOS, Koslowski said, connected-vehicle features such as navigation -- already offered in most infotainment setups -- would be controlled by Apple. Such control, Koslowski said, could pose problems for automakers, which want to use connected vehicles to define their brands and products. "That's where I see some potential tension going forward," Koslowski said in an interview. "That's going to be an interesting balancing act in the automotive industry -- to attract partners like Apple, but at the same time still hang onto that overall customer experience. If that's being given away to somebody like Apple, then it won't be much left for the automotive industry to succeed in the connected-vehicle space." But partnering with Apple could benefit automakers by improving unpopular or lower-quality systems and by driving creativity with unique vehicle applications that smartphones and tablets can't provide. Automotive brands planning to use iOS in their vehicles are Chevrolet, Ferrari, Opel, Nissan, Mercedes-Benz, Infiniti, Honda, Volvo, Acura, Hyundai, Kia and Jaguar, according to Apple. Eddy Cue, Apple's senior vice president of internet software and services, said Monday that iOS, which is used in iPhones, iPads and iPods, will be displayed on in-vehicle screens and allow customers to access phone features without lifting a finger. Cue said drivers can tell Siri, Apple's voice-activated telematics assistant, to play music, make phone calls, access maps and dictate messages with its Eyes Free feature. It's unclear whether Apple will move on to other functions such as climate control, headlights or mirrors. Efforts to reach Apple for further comment were unsuccessful. GM infotainment spokesman Scott Fosgard said the automaker was the first to install Siri Eyes Free in the 2013 Chevrolet Sonic, Spark and Opel Adam. Fosgard said the company has had "great experiences" with Eyes Free and looks forward to working closely with Apple on its iOS in-car integration. "We have the ability to give you that connectivity without you touching that phone. It's really unique because no other car company does it like we do in the Spark or Sonic," Fosgard said. GM is working on applications that don't exist in smartphones or tablets that will tap into data collected by OnStar to provide unique services, Fosgard said. The data include how much air is in the tire, fuel levels and route information. "We have 15 years of OnStar as a backbone. We know data about your car that could be useful to you if you choose to release it to someone," Fosgard said in an interview. BMW will equip its 2014 lineup with Siri Eyes Free through its iDrive control system. IHS senior analyst Mark C. Boyadjis said he considers BMW, which began using iPod integration in 2004, one of the biggest advocates of iOS in vehicles. Despite BMW's experience with Apple, the brand is not among those planning to use iOS in its vehicles. While he declined to comment on why BMW isn't partnering with Apple this time, BMW spokesman David Buchko said the company is very careful about its partnerships. "While we have the most robust iPhone integration, we think in the industry today, we're also very careful about what we provide access to," Buchko said. "That's why, for example, we have a very thorough vetting process for third-party apps that we put forward for integration in the cars." Buchko said BMW has worked closely with third-party app developers such as Pandora; Stitcher Radio, a podcast streaming service; and Glympse, a location-sharing app provider. "We're very cognizant about things we think are appropriate to integrate into our cars," Buchko said, adding that the company tries to limit driver distraction. Many vehicles allow users to use voice control to make calls or play music on their iPhones or iPods. Buick and GMC's IntelliLink, along with Ford's Sync are examples of existing systems. A Jaguar spokesman said the company is "working with a number of key global technology providers including Apple to develop new features and technologies," but declined to comment on future products, specific applications or time frames for implementing any features. A Ferrari spokeswoman confirmed the brand will have the service. "At the same time, Ferrari is continuing to look also into other directions. No comment at this time on models/timing." Koslowski said Apple executives realize that they cannot ignore the automobile if they want to "succeed in their digital dominance." 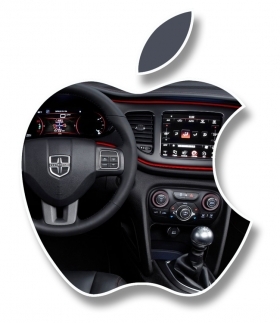 The fact that a dozen brands signed on shows the auto industry is keen to align itself with Apple, he said. As automakers move forward with this new integration, manufacturers should take the role of movie directors with telematics and enlist companies such as Apple as actors within their platforms, Koslowski said. "They can't afford to put all their cards in one mobile ecosystem. Even though Apple is still a leader in this space, Android and other platforms have shown there is still competition," Boyadjis said. "An automaker can't afford to say, 'We're going to sell our systems to everybody, but if you're an iPhone user you'll get so much more.' It just doesn't work that way."